The right-of-way of the Wallkill Valley Railroad passes through the Williams Lake property. Regularly scheduled trains ceased running in 1977, the tracks were removed in 1983-4, and the right-of-way was purchased from Conrail by John Rahl in 1986. Just a few days later, John Rahl sold to Walter Williams the portion of the land that lay within the Williams family holdings. Portions of this right-of-way, both within and outside the property, have been used as a rail trail by hikers, bicyclists, and horseback riders. After ATVs began to use the trail, the portion through Williams Lake was closed, enforced in part by a berm thrown up in relation to a gunnery range. 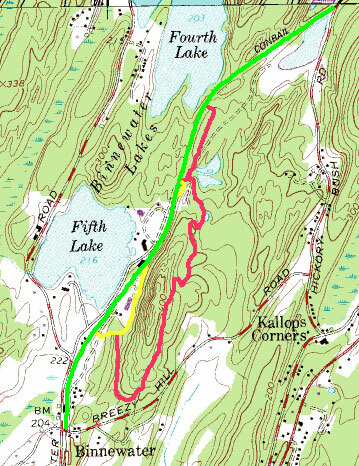 The HRVR DEIS states that it is their intent to reopen the rail trail and describes both a Preferred and an Alternate route, both east of the right-of-way and hence farther away from the lake and main hotel. The illustration shows the right-of-way (in green), the Preferred route (in yellow) and the Alternate route (in red). The Preferred trail route remains on the historic right-of-way for most of its length through the property, except for a 1000-foot section where it goes behind the Kiln Village townhouses that are part of the proposed development and a short loop around the proposed ampitheater. Slope. Although the route attempts to follow contour lines, it cannot avoid the rugged terrain entirely. In some places there is a 25% slope, well above that of a typical railroad. Although none of the DEIS drawings show the alternate route against clear contour lines, it appears to rise over 150 feet from the historic right-of-way before returning to its level. Casual bicyclists and mothers with baby carriages, both frequent users of area rail trails, would find the grades on the proposed trail to represent formidable obstacles. Curves. In order to follow the terrain, the route twists and turns, sharply in several places. A rail trail is shared by pedestrians, bicycles and, in many areas, horses, all of which travel at different speeds. The ability to see other approaching users is important to the safety of those on the trail. The Alternate route has visual blind spots at several points along its path. The Alternate route offers almost no views of Williams Lake. HRVR has not identified the criteria that will be used to choose between the two proposed rail trail routes. It is likely that the chosen spa / hotel operator will have a major influence on this decision. A map of the complete Wallkill Valley Rail Trail Project (1.2Mb .pdf) is available at the website of the Open Space Institute. The base map and route of the Wallkill Valley Railroad right-of-way were obtained from the USGS 1: 24,000 topographical map for the Rosendale, NY quadrant. The route of the proposed alternative trail routes was obtained from the 4 May 2011 HRVR DEIS, Appendix E.1. A 600 Mb zipped file containing all of the DEIS Appendices can be downloaded from the HRVR website. Last updated 7 Jun 2011.